This report presents the findings of the first phase of the Police Foundation’s study on the Informal Resolution of police complaints. 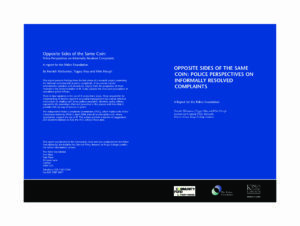 It examines the Informal Resolution process from the perspectives of those involved in the implementation of complaints procedures. It also briefly assesses the views and perceptions of a sample of 100 operational officers. Welfare or well unfair: are sickness absence policies in policing counterproductive to the welfare agenda?